Win a Dream Vacation for Two!!! 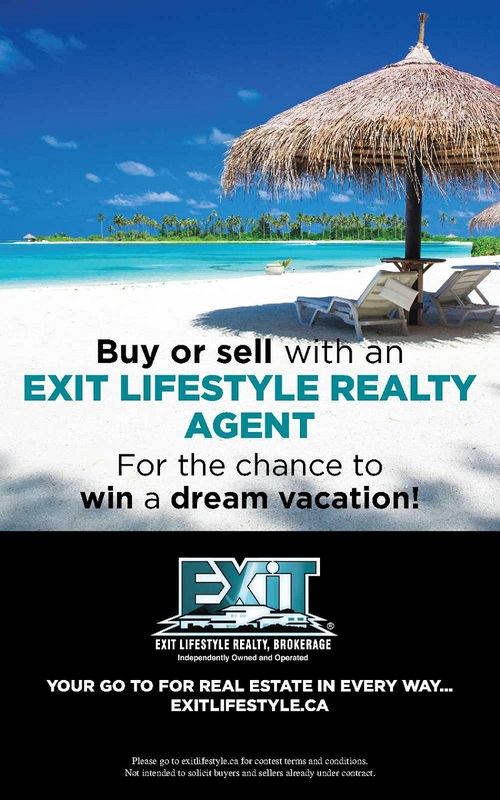 Every Buyer or Seller that purchases or sells a property through a EXIT Lifestyle Realty, Brokerage Salesperson in 2019, will automatically be entered to win. The transaction must close between January 1, 2019 and December 31, 2019. There will be one ballet entered for each transaction closed and said ballet will be in the name or names of the Buyers or Sellers closing the transaction. The lucky winner will receive a travel certificate with a net value of $4000. The certificate must be redeemed by December 31, 2020. This draw is not open to EXIT Lifestyle Realty, Brokerage Salespeople, staff or immediate family members of the aforementioned. Travel destinations are subject to availability. The travel certificate is non-exchangeable, non-refundable, has no cash value and must be accepted as awarded with no substitutions. The certificate winner consents to the collection, use or disclosure of his or her personal information by EXIT Lifestyle Realty, Brokerage for the purpose of administering the Certificate, awarding the prize and announcing the prize winner, as applicable, and any subsequent advertising or promotion related thereto. The certificate winner agrees that EXIT Lifestyle Realty, Brokerage shall have no liability and agrees to release, indemnify and hold harmless EXIT Lifestyle Realty, Brokerage from and against any injuries, losses, damages, claims, actions, demands, suits, proceedings, costs, expenses including without limitations to any legal fees and liability of any kind resulting from or arising directly or indirectly out of the winners use or participation regarding the winning of the Certificate. Leased transactions are not eligible for this contest. Any promotional materials distributed by EXIT Lifestyle Realty, Brokerage or its Sales Representatives regarding this contest is not intended to solicit any Buyers or Sellers presently under contract with another Brokerage.